Double vinyl LP pressing in gatefold jacket includes CD edition. 2018 release, the highly-anticipated sophomore album from Christine and The Queens - AKA French pop songstress Héloïse Letissier. 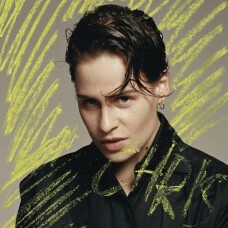 Chris was not only written, arranged, and performed by Christine and the Queens, but also recorded in English and French. Born in Nantes, France, Letissier studied theatre before forming her solo musical group Christine and the Queens. Her work combines music, performance, art videos, drawings and photography. She adopted the name Christine and the Queens releasing her debut EP Miséricorde independently followed by another EP in 2012 called Mac Abbeywith. That same year, she was the opening act for Lykke LI, The Dø and Woodkid as well as for Lilly Wood and the Prick in 2013. Her third release was an EP titled Nuit 17 à 52 which garnered her first charting on the official French Albums Chart SNEP with the help of it's title track. Her debut album - Chaleur humaine - was released in 2014.